More counselors are incorporating mindfulness meditation into their practice. Scientific studies have been done about the effectiveness of this meditation technique, and it is used worldwide. It is becoming a more common practice because these studies have shown it to be an effective way to increase your mental and physical well-being. Mindfulness encompasses a wide variety of meditation exercises that help to calm the mind and body, bringing you into the present moment. These techniques have existed in many different Asian cultures for thousands of years to help with both religious practice and overall health. What many of us learn or practice is simply a version of meditation that Buddhists created over 2,500 years ago. The main purpose of mindfulness to utilize a variety of different meditation and breathing techniques in order to focus on the present moment. You focus on the present moment in order to pay better attention to both your inner and outer experiences. Mindfulness focuses on observing these experiences and accepting them with an open heart. Mindfulness practiced on a regular basis can lead to a wide variety of benefits, both mentally and physically. While there is still a lot we don’t know about the full extent of the benefits of mindfulness meditation, many different researchers are taking on the challenge. Several different studies have been done at the University of Wisconsin in Madison looking specifically at the effects. A couple studies in particular reviewed interesting components of mindfulness. One found that when basic mindfulness techniques were incorporated into the classroom when students were young, they experienced fewer outbursts and the children were much more able to articulate their feelings. In a sense, it can also help children learn empathy for others by identifying their own feelings and finding ways to relate. The same university program also did a study looking at how intensive mindfulness could be used to help veterans returning home from combat situations cope with post-traumatic stress disorder (PTSD). Just one week of intense, guided mindfulness work drastically helped the test group to reduce suicidal ideation, improve outlook, and even improve some of their biometrics, such as heart rate and blood pressure. 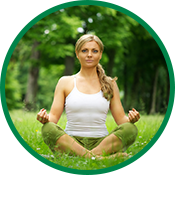 There are a few key components to practicing mindfulness in order to help improve your overall health and well-being. One of the key tips for healthy living and incorporating mindfulness into your lifestyle is to practice some of the techniques every day. It doesn’t matter if you only practice one technique for five minutes; that practice can lead to benefits and can also help to prepare you for times of high stress and anxiety. With that in mind, try some of the following mindfulness breathing exercises on a regular basis if you’re looking to dip your toe into mindfulness meditation. One of the most common beginner breathing exercises for mindfulness is known as the Relaxing Breath or 4-7-8. Sit down and make yourself comfortable. Look towards the ground or gently close your eyes. Breathe in for four counts through your nose. Hold the breath deep in your chest for seven counts, and then slowly breathe out through your mouth for eight counts. Keep repeating this pattern for five minutes. You should finish feeling more relaxed, with less tension, and more at ease. During this breathing exercise, you will take roughly ten minutes to sit comfortably and focus on deep, cleansing breaths. Think about how the breath feels and release tension with each exhale. During this process, you may find that your mind wanders. That’s okay. Anytime your mind wanders off, observe what it wandered to, give it a label, and refocus back to your breathing. These labels can be anything from labeling a distraction to labeling a worry. Simply pick a word or two to label it, and then set it aside. When you’re finished with your deep breathing, you can opt to look at the label themes and address any if necessary. Whenever tips for healthy living come up, more often than not, you’re going to hear about mindfulness meditation. We’ve only scratched the surface covering the benefits of mindfulness, and there are many different ways to practice it and learn more. It’s an exceptionally beneficial skill to learn and utilize in your life every day in order to help you to relax and learn beneficial stress reduction skills. Start practicing today! Pingback: Mind and Skin Connection: How Your Mental State Affects Your Skin - American BioSciences, Inc.